The first week of Falkirk’s new parking enforcement regime brought no fines for misguided motorists but tickets will be issued if drivers do not toe the line. Falkirk Council confirmed its seven-strong team of parking attendants only gave people warnings – a process the local authority says will continue for the first few weeks before the attendants start slapping fixed penalty notices of up to £60 on the windscreens of offending vehicles. Residents with no driveways in the town’s Weir Street and Garden Street have raised concerns about where they will now be able to legally park their cars. The council responded: “The existing waiting restrictions in Weir Street and Garden Street have been in place for over ten years and have not changed with the introduction of decriminalised parking enforcement. While motorists still have a week or so to get used to the change, the message is a hard one to miss with posters dotted all over the town – especially in known illegal parking “hotspots” – and the attendants themselves wearing clearly identifiable blue uniforms. 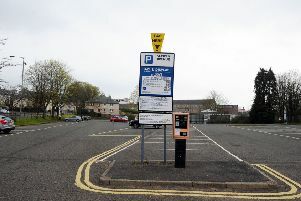 It is not all bad news for motorists looking to park in Falkirk town centre in the next month. Falkirk Council confirmed, while there are no proposals to change any of the parking charges on the approach to Christmas, the free after 3pm policy will continue throughout the festive period.